Philippines, having Catholics as the majority of its population, has a very old tradition of celebrating and observing All Saints’ Day (Todos Los Santos) and All Souls’ Day (Undas). reached Heaven (Catholic Online). It is a day when we pray for their souls to finally rest and be with the Lord. Although these two festivities are really separate and distinct from each other, in the Philippines, however, it is not generally the case. Most Filipinos visit cemeteries or memorial parks during November 1, as it is the declared non-working holiday by the Philippine Government.Usually, Undas is celebrated for 3 days (from October 31 to November 2), a typical Filipino thing of making celebrations longer that they actually are. The preaparation starts at least few days before the actual day of celebration. 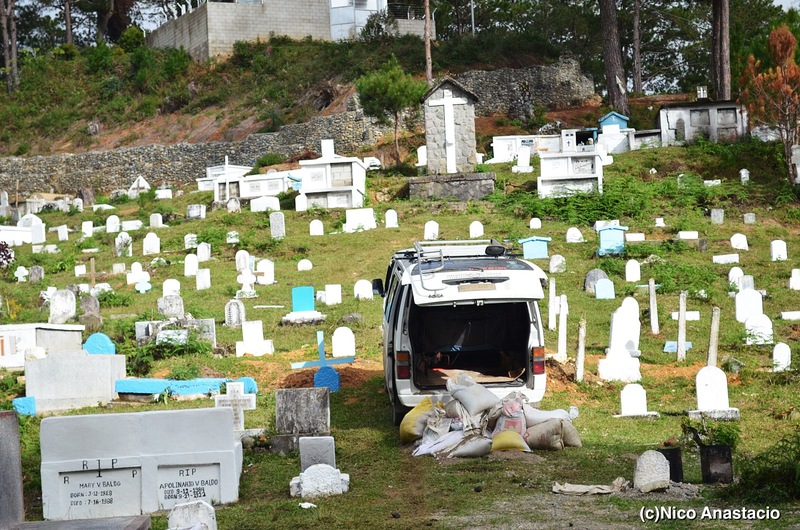 Members of the family go to the cemetery to clean (usually weeding and some repainting of tombstones). They also go to different grocery stores or public markets to buy candles of different colors, beautiffully arranged flowers, as well as ingredients for the food that they will prepare during the celebration. Although Undas is ought to be a solemn tribute for our departed loved ones, Filipinos tend to make it a very festive celebration. Aside from the fact that Filipinos are generally festive, I think that the main reason why it is celebrated that way is because of the belief that we want our loved ones to be happy also as we pay them a visit. Any celebration will not be complete without food, even Undas. Different kinds of food are served at the cemetery, depending on the liking of the family.For instance, in our family, we commonly prepare lunch and some snacks, which we can share to other people. Pangangaluluwa – it is a practice usually done in rural areas of the country. It is done by a group of people through singing and asking other people for limos (alms) and dasal (prayers) (Newsflash). According to the belief, these people supposedly represent the departed souls of our loved ones who are still in the purgatory. They are asking for prayers from the living so that they could finally ascend to heaven. It is done at the night of All Saints’ Day. Pagpapadasal – some Catholic Filipino families do a 9-day novena at home, with the last one usually held at the cemetery (Thelma Alberts). Pag-aatang – this is an Ilocano tradition where the living family members pay tributeto their departed loved ones by offering food to them (Newsflash). We should not forget the real reason for having this celebration, which is to give honor to our loved ones and pray for their souls. We have our different ways or approaches on how to do this, however, we should always consider that we have to be respectful and courteous with other people, who also want to offer their prayers to their departed loved ones. Therefore, we should avoid being too loud in order for us to preserve the solemnity of this day. Always make sure to check the traffic situation in your area before you travel. To avoid inconvenience, pls make sure that you do not bring all the those which are not allowed by the Philippine National Police, such as knives, guns, among others. If you can also avoid bringing your young children or family members, pls do so. Although there are police officers stationed at the cemeteries, we are not always certain about their safety. Always make sure that you also know where the first aid stations are. So that, in the event that you need them, you know where to find them. Pls always bring a garbage bag with you. Do not just throw your garbage anywhere. Remember, “garbage in, garbage out”.